In our last lesson, in our look at Cinema 4D Lite, we talked about what happens when you import a .C4D file directly into After Effects, and then drop it into a composition. The Cineware effect is immediately applied to it, so you can see and work with the model in your 3D enabled composition. In this lesson, I want to talk about the first option after the Cineware and Live Link options, and that is your Render Settings, and more specifically the Renderer setting. You’ll probably notice that when you import your .C4D model into After Effects, it doesn’t look very good, and there is a 3D grid that’s visible. So, what’s going one? Well, this is where the Renderer parameter comes into play in the Cineware effect. 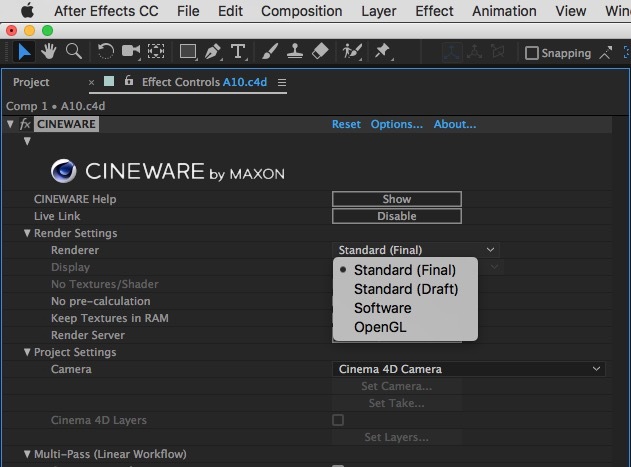 Keep in mind the Renderer setting will always be set to “Software,” when you add a .C4D element to your timeline. For the most part, the composition window will reflect that of the Cinema 4D Viewport and serves to preview the scene. Shaders and multi-passes will not be displayed. No antialiasing here, and can be used as the preliminary stage to final rendering. Renders the scene using the render settings defined for the Cinema 4D scene. The Cineware plugin will render the scene using OpenGL and shaders and multi-passes will not be shown. In most cases, you’ll find yourself swapping back and forth between the two Standard settings to get a low and high resolution version of your finished model in Cinema 4D Lite.